Lodger reverse auction in 90 minutes! Lodger footwear is conducting its first reverse auction today. 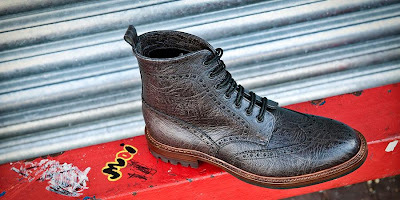 The shoe of the month – a glorious boot in unique, one-off Kudu leather – will start at full price at 12pm UK time. It will then drop in price by £2 every minute until someone emails the company, calls or steps into the shop and offers to buy them for that price. The boots will be made up exclusively for the customer in whatever size they wish, with their name on the inside. To follow the auction, which is being conducted on Twitter, go to Twitter and search for LodgerFootwear – or go to twitter.com/LodgerFootwear. A new auction with a new pair of shoes (though only in one size in the future) will be conducted every Friday on Twitter. So sign up now to keep track of it. The boots were sold for £233, down from £415. Next auction is Friday October 2. You can follow the discussion on Lodger reverse auction in 90 minutes! by entering your email address in the box below. You will then receive an email every time a new comment is added. These will also contain a link to a page where you can stop the alerts, and remove all of your related data from the site.